What is “The Lab” mobile slot about? 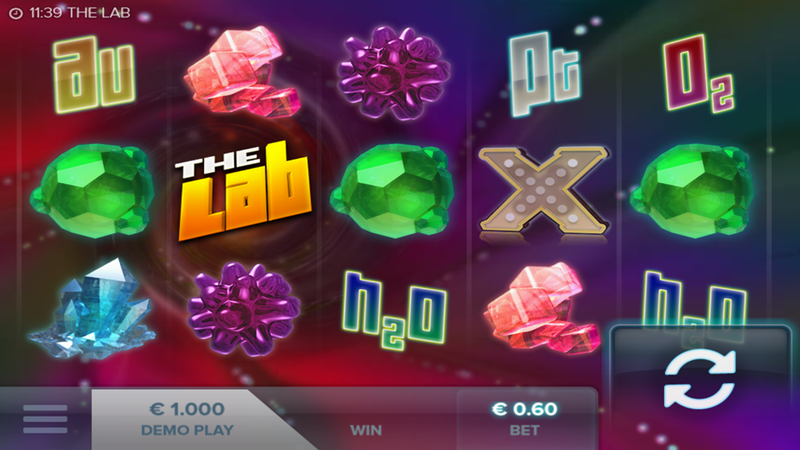 The Lab is a chemistry themed mobile video slot released by Elk Studios that is available on smartphones, tablets or mobile devices that run iOS or Android operating systems (e.g. iPhones). There is no download requirement as the app is scripted in HTML5. The slot allows for 15 paylines to be played per spin and hosts a 5-reel, 3-row interface. Coin integers range from between €0.01 to €0.10, inclusive. A maximum of 15 coins can be played per spin and a maximum prize wins a jackpot return of up to 46,000 coins. Game features include sliding reels, wilds, multipliers and free spins. There are no bonus games. Elk Studios’ The Lab is a fun little chemistry based video slot. The game symbols are all chemistry related and include chemical symbols as well as pictures of gemstones. The backdrop is animated to depict a vortex – this vortex actually is incorporated into the game as a feature and isn’t just a random backdrop animation. This 3D slot is well illustrated but animations are quite limited throughout the gameplay. On a side-note, the game has down O2 and H2O as elements when they are actually molecules – but most people won’t care about that. The Lab requires players to wager on up to 15 paylines in an attempt to match 3+ of the same symbols on an active payline. By doing so, players can win up to 46,000 coins as a maximum prize; other prizes can be viewed in the game’s inbuilt paytable function. Coins can be valued as low as €0.01 to as big as €0.10 meaning that a spin can cost from €0.01 to €1.50 each time. The highest paying symbol is the green gem, which pays out 1,000 coins. Conventional slot rules apply and further rules can be seen in the game’s rule function (same place as the game’s paytable function). Game symbols include various coloured gems (green, blue, purple and red), various elements and molecules such as Au, Pt, O2 and H2O, the lab game symbol (wild) and an X (scatter). The highest paying symbol is the green gem, followed by blue, purple and then red. Landing the game symbol over the vortex on reel 2 triggers sliding reels and activates the free spins. During the 10-20 free spins, the game symbol becomes wild and substitutes for all other symbols except for the scatter. Another thing to note is that during these spins, reels 1 and 2 will freeze and only 3, 4 and 5 will spin. The scatter will multiply winnings by 2x for all visible winning combinations and there are no further bonus features. Walter White is in the house!